This recipe takes about 2 minutes, and beats the pants off bottled caesar salad dressing. I highly recommend pairing this with my cast iron croutons (the croutons add about 15 minutes of prep time). I use red wine vinegar, but white wine, apple cider, and a host of other vinegars would be just fine. The only vinegar to avoid in caesar dressing is balsamic vinegar... which is to boldly flavored. You can also make a larger batch of this dressing and save it in the refrigerator for up to two weeks. Place your pressed garlic in the bottom of a wooden salad bowl. If you don't own a garlic press, just mince the garlic finely, and then smash it with the blade of a knife. Add the kosher salt, and use a spoon to further smash the pressed garlic and salt together. The salt acts as an abrasive to help break down and smash up the garlic. Once the garlic is nicely smashed (after 30 seconds perhaps? ), add the olive oil. 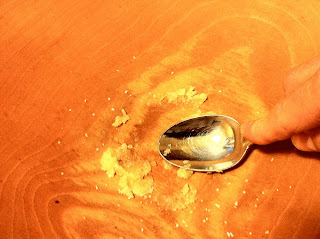 Use the spoon to scrape the garlic off the sides of the bowl where you did your smashing. Add the dijon. Dijon mustard is an important ingredient because it causes the oil and vinegar (once added) to form an emulsion instead of staying separated. The emulsion makes for a salad dressing that coats the lettuce leaves instead of running off them to the bottom of the bowl. With your dijon, oil, and garlic mixed together, add the worcestershire sauce and red wine vinegar. Mix things around again, and taste your dressing. It should taste strong, but balanced. It should have a nice punch of salt, garlic, acid, and savory flavors. If any of these flavors is too strong, consider adding some olive oil and a slight bit of the not-so-strong ingredients. If you adjust to the point where you've got too much dressing for the salad, save a little off and use it later. It's a good idea in any case to save off about half your dressing before adding the lettuce. You will very likely add all that dressing back, but it's much easier to add salad dressing than it is to remove it! So, with half the dressing saved on the side, add your washed and chopped (not ripped) romaine to the bowl. Toss the romaine with the dressing, and then taste a piece. You'll likely add all that dressing back, but be sure to add a little and re-mix and re-taste to make sure the dressing doesn't become too thick or overpowering. With your salad and dressing in balance, it's time to add your egg (optional). To do so, break a raw egg into your salad, and toss things around until the egg evenly coats the lettuce (with yolk broken, of course). Add your grated parmesan and re-toss. Toss your cooled croutons on top, and crack some black pepper for garnish. Serve immediately, or at least within 10 minutes. Does it have to be in a wooden bowl, and if so,why? A wooden bowl is better than metal for sure, since you can grind the garlic and salt together with a metal spoon, and not worry about introducing metallic tastes into your dressing. Plastic is nearly as good.